Peek at a bald eagle visit and a new baby. Mondo wingspan, major love: Lend the condors some support at a September fundraising party. MEETING OF THE MINDS: Sometimes, even if we consider ourselves ardent aficionados of the natural world, we can compartmentalize plants and animals, in our minds, a bit too much, forgetting that there is a flow afoot and seemingly unlikely unions can occur. Delicate rhododendrons can spring up near towering redwoods and cooling streams can trickle through the warmest of landscapes and different majestic birds can call upon each other to say hello. That last occurrence was seen on the Condor Cam in April, when a bald eagle was spied visiting a Big Sur neighbor, the condor. It's a rather stunning photo, and a reminder of the lush and powerful wildlife that call the California coast home. WILDLIFE, of course, that needs our human courtesies and protections and attentions, especially since our condor population dwindled to alarming numbers just a few decades ago. Things are on the up-and-up where the condors are concerned, but, of course, "the up-and-up" sometimes doesn't move quite fast enough and/or needs our assistance. Feathers in Flight, the annual fundraising event for the California condor, is one way to goose the up-and-up. The event raises money that bolsters condor-focused programs, but it also helps spread and grow condor love (youths under 17 are admitted free to the fundraiser, so think about bringing the kids, who one day may fight for the condors and other endangered species). RANCHO GRANDE is the spot, the date is Saturday, Sept. 12, it is an afternoon affair, and the cost is ninety dollars per person. 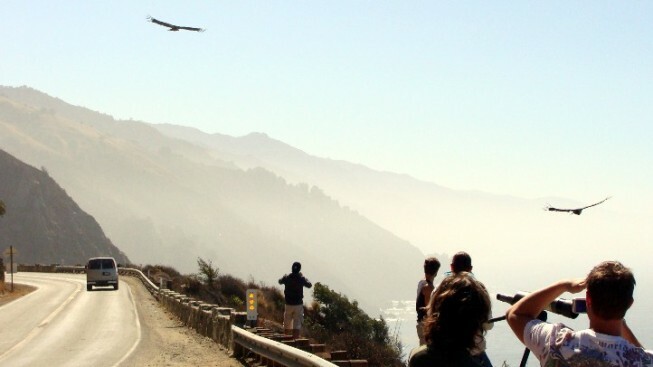 Some big birds will make cameos at the Big Sur soiree, including a golden eagle, and some falcons and hawks, too. Gorgeous stuff, but the birdly doings don't stop here: Condor-themed gifts will be sold. Ocean views, local beer, sweet bites, and more await. And if you need more condor love right now, check out video of a baby and doting mother who has taken up residence inside a redwood tree. Mom's name? Redwood Queen.